The Endless Everywhere War? America’s War of Terror, 1.0, 2.0, 3.0…. Ever since the Bush administration’s militarized response to 9/11 there has been debate within the US national security community about the implications of a ‘boundless war’ and potentially ‘endless’ war. A whole military-security-defense complex congealed around this ‘war on terror’ while smaller states maneuvered to position themselves as allies of the US and its new strategic agenda. The Bush administration gave us the Global War on Terror (GWOT), the original, 1.0 War on Terror. Its modalities featured high profile regime change operations, US ‘boots on the ground’ and counter-insurgency as its responsive doctrine to encounters with the blow-back from imperial governance and strategic blunders. Even before its end, the Bush administration had ditched the GWOT and began transitioning to a War on Terror, 2.0. This transition took some time though and bridged the second Bush and first Obama administration. Here the modalities were different: lower profile special operations, drone strikes in Af-Pak and Yemen, and a counter-terrorism doctrine (after Obama choose, for political purposes, to briefly surge the counter-insurgency effort in Afghanistan). What appears to be enduring is (i) the perception that the war on terror is not going to end soon, that the original 2001 Authorization to Use Military Force against al-Qaida is still relevant and needs to remain because Al Qaeda and “associated forces” are proliferating and (ii) that the battlefield is global and, therefore, that the US military requires global military capacities, and technological systems, to respond to this threat. The ‘endless everywhere’ principles, thus, seem to be intact, and a recipe for a permanent war on terror complex (a deep state, a top secret America) within the US. The questions Ian Lustik raised years ago in his excellent Trapped in the War on Terror are more relevant than ever. 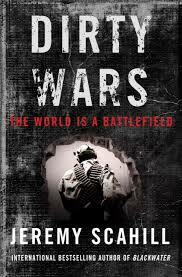 To the burgeoning literature on critique of the assumptions and practices characterizing America’s war on terror comes Jeremy Scahill’s latest book which I have sitting before me on my desk, Dirty Wars: The World is a Battlefield. There’s also a documentary of the same name about to be released. I’ll post on these as a find time to work through them. I don’t expect it will be pleasant reading. How this plays politically is interesting. At yesterday’s hearing, it was Republicans and Independents who appeared most critical. Angus King (I-Maine) criticized the use of the phrase “associated forces.” “You guys have invented this term, associated forces, that’s nowhere in this document [the original 2001 authorization],” King said. “It’s the justification for everything, and it renders the war powers of Congress null and void.” Sen. John McCain (R-Ariz.), expressed incredulity over the Pentagon’s broad interpretation of the AUMF. “None of us” who voted for the law in 2001 “could have envisioned [granting] authority [to strike] in Yemen and Somalia,” McCain said. How interesting that Senator McCain is saying such things! This entry was posted in CIA, Current affairs, drones, Geography, Geopolitics, George Bush, war on terror, Washington D.C., Yemen and tagged Dirty Wars, Scahill. Bookmark the permalink.